The chances are that if you have not heard of Chris Gunning you may, anyway, have encountered his music. If you have seen that delightful detective series ‘Poirot’ starring David Suchet then you have come across the signature tune and incidental music. You could even have encountered some of Gunning’s many award-winning film scores such as ‘Wild Africa’ and ‘When the Whales came’. When I asked myself whose music it reminded me of whilst listening to the Third Symphony I thought of Alwyn who was also a successful scorer of films, and more symphonically I thought of David Matthews although he is more serious in intent. It’s probably advisable to start with the opening work - the five-movements-in-one Third Symphony. The booklet notes have been written succinctly by the composer. He gives us the background. The work was written at a time of personal crises both for the composer and for his wife who were both diagnosed with serious illnesses. The work is not always cataclysmic or dark. It does however have a powerful opening movement and a scherzo of skittish colour fascinatingly orchestrated. The Symphony beavers away obsessively at its opening discordant harmonies. The influence of one of Gunning’s earliest teachers, Edmund Rubbra, can be detected here, not in the sound of the music but in the way that he is incredibly economical with his material. These chords run through the entire work right to the final bars. The Oboe Concerto is a pleasing if not momentous ‘piéce d’occasion’ written as a birthday present for his daughter Verity. She plays it here under the baton of her father. The middle movement is a moving elegy written on the day of the death of Yasser Arafat in November 2004. The first movement is English pastoral in the best tradition. I heard it for the first time whilst driving around the remote lanes of North Northumberland for which it seemed a perfect backdrop. The finale strikes me as a little long for its material but, if regarded as a piece of light music, then the work becomes most satisfying. It should be taken up by young musicians. 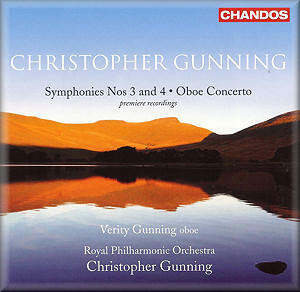 Verity Gunning has a beautiful and elegant tonal quality which her father exploits to its full potential. But it’s the Fourth Symphony I will return to most often and already have done. It is also in five continuous sections - separately tracked - and is based on the opening material. It has a strong sense of organic growth especially in its central section, another Rubbran influence I feel. It was written at a time when the major health troubles of 2005 where behind him and his wife. Gunning wanted to write a work which could “express a sense of triumph over adversity”. He describes the closing, exciting fanfares as bringing “matters to a positive close”. I would not disagree with that except to say that the harmonies remain dissonant and the struggle is not easily overcome. There are sections at the beginning and end when certain kinds of heroic film score come to mind; never mind, this is also true symphonic writing. The performance of this work, as with all three under the composer’s steady baton, seems to be exemplary, with complete commitment from the RPO especially the hardworking brass section. One assumes that what one hears is what Gunning exactly wanted. The recording is vivid and beautifully balanced. I did wonder however whether these works have actually received their first live performances as Gunning’s notes give no details. I have enjoyed these works and suggest that you try them yourself. However they are not as inspired to, my way of thinking, as the Poirot signature tune which will remain immortal.